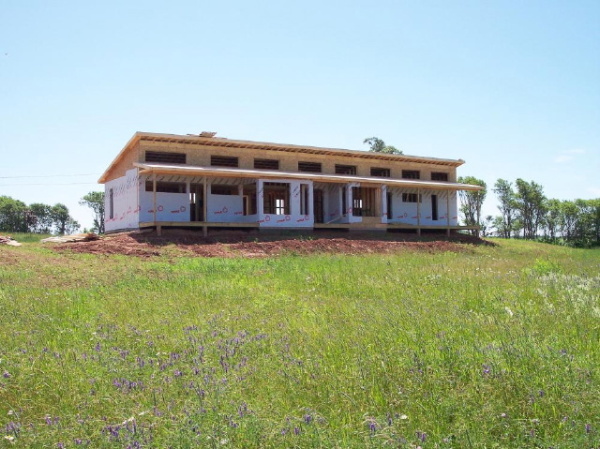 First photos of a new 0242 Plat House under construction on Prince Edward Island On a beautiful site overlooking a lazy bend in a river another Plat House is taking shape. This Plat House has been modified to create 3 bedrooms, and adjust the roof overhangs for its siting facing roughly north. There have also been some other common sense changes for climate with the window sizes. 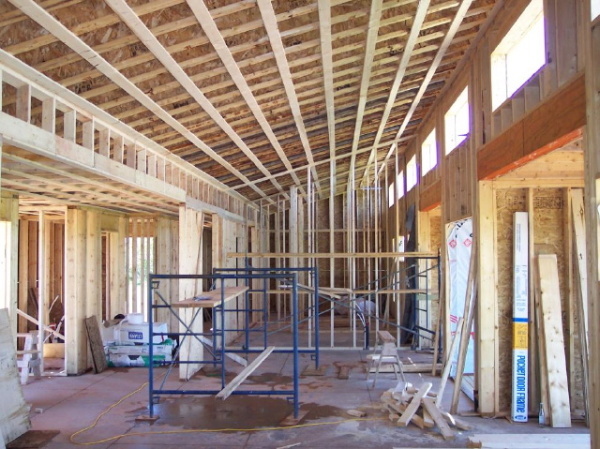 The owners worked with local PEI architect Ross Macintosh to prepare a modified floor plan to suit their needs. Inside we can see that they have built the house on a radiant heated slab - very nice. We are very happy to not only see more Plat Houses built, but also to see people fearlessly adapting them to their needs. We are looking forward to seeing more of the other Plat House projects underway in other parts of the country. Continue reading "0242 Plat House on Prince Edward Island"
Adding the deck back in, and trying a different roof line. The input from the first scheme was that the upper level balcony was really desired. This dictated opening up the existing bedroom windows to doors. As far as the roofline, while it was worked into the new composition the feeling was that the image of the old house roofline was still too strong and they wanted it to go away! This feedback led to the development of a new scheme, shown here: Now the existing roof line is hidden behind a new fascia, the roof slope of the new master bedroom turned to match up with the new fascia. The existing roof line still exists behind so we still manage to avoid reframing the existing roof, but the house turns a completely new facade to the street And yes, that is the existing attic vent worked into the new composition! This is still a rough massing model which will need further development. Continue reading "Small addition, second scheme"
What ever happened to all the Good Vinyl Siding? Huh? What kind of question is that? When was there ever any "good vinyl siding"? Well that's the point. There wasn't ever any. It's easy to knock vinyl siding. I doubt many people reading these words here really like vinyl siding very much. When its mentioned here its most often in derision or as a way to describe the mediocrity of mainstream house building practices. I don't want to simply "pile-on" a product that is scorned in our modern community. I really want to try and make sense out of it. Why has an industry as big as the home building materials industry singularly failed to make a decent vinyl siding product? On the face of it, vinyl siding sounds like a good idea. Here we have a cladding product that has integral color, does not need to painted, it is light weight and easy to install with average skill sets. It is relatively inexpensive and widely available. A do-it-yourselfer can tackle it without fear and achieve results comparable to a pro. It is durable and resilient, and easily repaired(replaced) if damaged. As a plastic product it fulfills much of the mid-century promise of a future made easier through technology. What is wrong with that? Why oh why can't somebody make a vinyl siding panel that would be happy to just be what it is - plastic? Would that be so bad? Saturn can make a plastic bodied car. Plastic kitchen appliances can be molded in sumptuous shapes. How have we gotten to the point where we would be adverse to a plastic clad house, yet willing to accept a plastic sided house trying to look like a wood sided house? As described above plastic has a leg up over wood siding in many ways. Integral color, less costly, fast installation, light weight. These are positive characteristics that can build a compelling value statement in any product, and they are already well understood in the building industry. What we need to do is unleash plastic from its insecure identity, release it from its imitation of wood products and let it as a product set out to realize its full potential as a cladding material. Any siding has a multi faceted mission. It has to shed water and keep out wind driven rain. It has to be easy to install and interface well with adjacent building products like windows and doors. And lastly it has to make a nice and attractive appearance, one that leverages its inherent properties, and hence projects a character of authenticity. 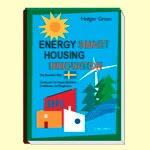 In the building industry today we see a movement for sustainable building products. Some of these new materials involve the recycling of consumer plastic and put what would otherwise be a terrible waste product back into long term use. Plastic and plastic/wood composite deck boards are probably the most obvious product. The number of products on the market have increase rapidly as manufacturers from many related areas have rushed in to attempt to grab a piece of the rapidly expanding market. Clearly there is interest in utilizing recycled plastic content in new building materials. It seems the stage is set for one or more of these players to venture into a cladding product that also leverages this recycled material stream. If one of these manufacturers were to make a cladding product, what would this "good vinyl siding" be like. Well first off it will need to find its own form. The profiles that have been based on copying wood lap siding profiles and molded shingle textures are compromises. They have leveraged plastic's ability to copy, but not is capacity to get the job of being siding done better. We need a panel with a corrugation pattern that will lend the panel stiffness it requires to eliminate sagging and rippling - flaws that project a thin and insubstantial characteristic to the material. 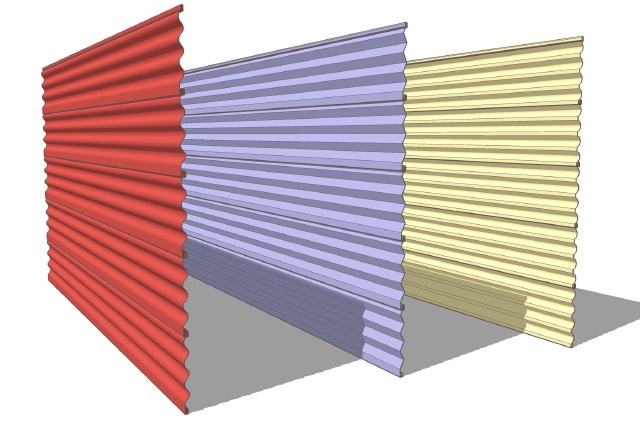 These new corrugation patterns should be original and unique to the material, based on both the quantitative value of adding rigidity and the qualitative value of finding a pleasing and confident expression of its material character. We need more panels that work in a vertical orientation, as that is as easy to achieve with this material as is horizontal. Now that we are released from the precedent of horizontal lapped wood siding panels we can exploit new forms dedicated to a vertical orientation. Lastly we need new molded tile forms, akin to the process used to make faux wood shingles. New expressive forms can be created here, with effective water shedding joints that no longer need to be hidden behind the edges of our phony shingle facade. And these new siding products must be made to take advantage of our consumer waste stream, to repurpose plastic content from short term product cycles to long term building cycles, locking this waste into useful long life term utility. Why is nobody moving to make this product? Is there no confidence in the american public to adopt an authentic product like this? Clearly the housing market would be slow to do so. Aside from our small modern movement most of the public would not understand a product like this. But it would find its place in light commercial construction where such phony schmony product as conventional vinyl siding is not always desired. If produced on a cost level with existing vinyl siding this new product could easily gain a foothold in light commercial construction, and then be readily available for new modern housing that is proud to wear an authentic expression of our times. The candidates to manufacture this product are out there. Either one of the many players in existing vinyl siding, or one of the many new players in recycled deck boards and railing systems. There is a yawning opportunity there for a manufacturer with a vision. So let this be a challenge to the industry - make it, they will come. Vet some idea, do some basic market research. Run some limited prototypes - I will help you find an application to test it. And you modernists out there - let your desires be known to these players. We want good, modern, affordable, effective cladding for our modern homes. We are waiting for you to serve us - who will be first? Continue reading "What ever happened to all the Good Vinyl Siding?" 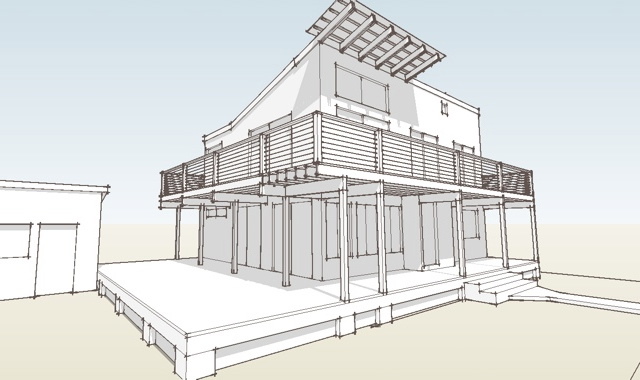 The first sketch proposal for the addition to the small beach house. First I should explain the context that this house is in. I use the term "beach house" because the community where its located is at the beach, but few if any houses are truly on the beach. All houses are excluded from the dune zone and sit in a zone inland from the dunes. Some of the houses which are right against the dunes will be bigger, taller to attempt to look over the dunes for an ocean view, but most have no chance! Sounds bad but it preserves the fragile dune ecosystem and protects the houses from atlantic storms. So what you have on the inland side of the dunes are older communities with a network of streets which are pretty similar to other late 40s early 50s neighborhoods. Mostly a grid of narrow streets without sidewalks. These stretch to the other waterfront which is the bay side. I didn't explain that. Most beaches here are not on the mainland, but on large barrier islands that lie just off the mainland. So these beach communities lie on these narrow strips of sandy island with a bay on one side, and the ocean on the other. So our project lies one property away from the bay, and about 3 blocks from the ocean. In placing the new bedroom above the one story porch - essentially turning the roof deck into the master bedroom - we will be providing it with a great view of the bay. The owners also wished for a balcony on the second level, something I felt might be beyond the budget and omitted from the first scheme. The idea here was to incorporate the existing roof line into a new and more dynamic profile. By removing the rake overhang and bringing the existing roof into a more purely geometric form we could bring out a more modern quality. This strategy also preserved the existing roof framing, and minimized our intervention, to extend what we could do with the budget. 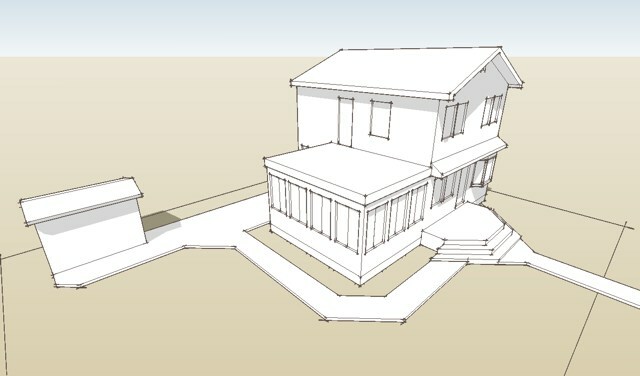 We also proposed a new wrap around porch, a characteristic of some of the older beach homes that date back to the late 1800s, early 1900s. It is a great mediating space between the street and the house, and a "hedge" that could easily become a balcony in scheme 2! 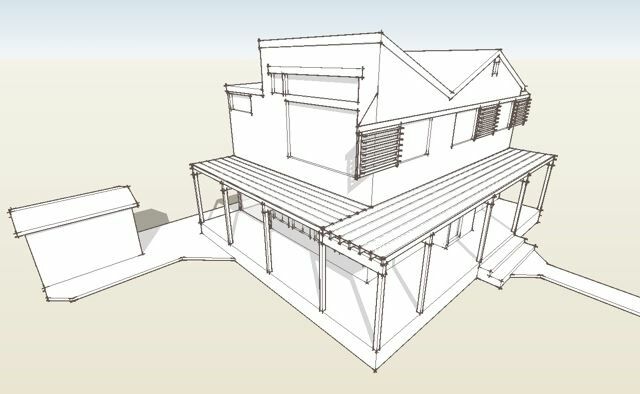 Continue reading "Small addition, first scheme"
An addition to a small cottage in a seaside community I thought I would share this project through the blog. 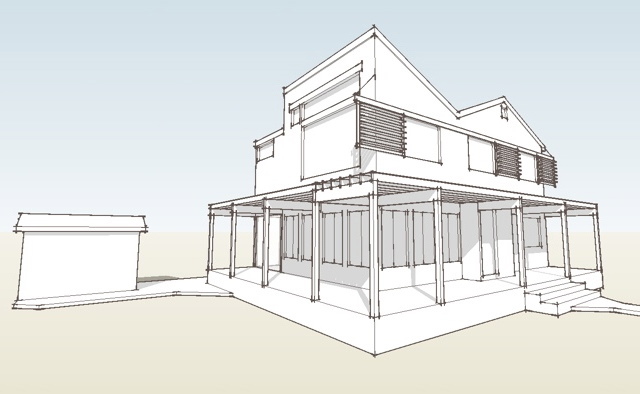 It is not a stock plan, nor a prefab, but a small addition for a client who has a modern sensibility and wishes to transform their existing house into a modern house. 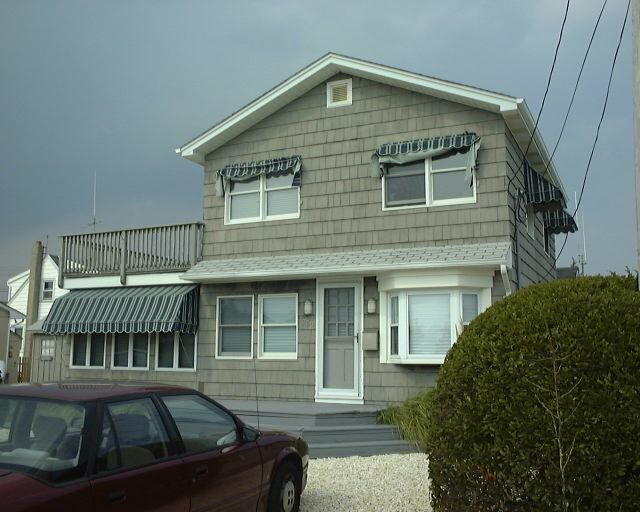 The existing house was a typical one story beach cottage, like many that were built on the NJ shore communities during the 1950s. Some time later it had an addition to create a second floor and a small side porch. There are 3 small bedrooms upstairs and one bathroom. The owners wish to add a new master bedroom and bath to the second floor, and "re-invent" the exterior to make the house feel modern. They collected a wonderful range of images which they presented to me in the form of a collage. This has been a consistent reference point for me as the project has progressed. Some of the images were from their travels, others clipped from Dwell. 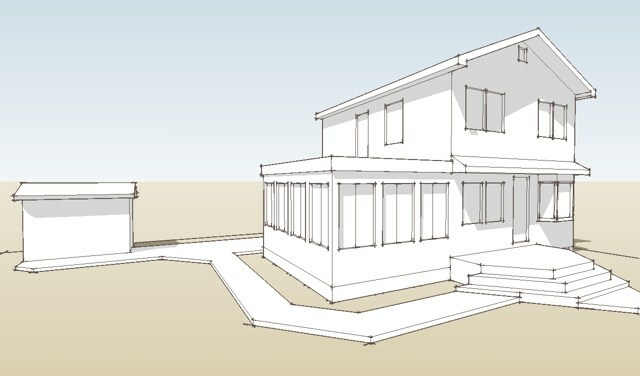 The first step in the design process after measuring the exiting conditions is to mockup the existing house in 3d to work with during design. The small roof deck over the porch has a great view of the bay, yet the owners rarely use it because of its location. Budget is always a concern on projects like this so the question was how to re-invent while keeping the work limited. Thats it for now. 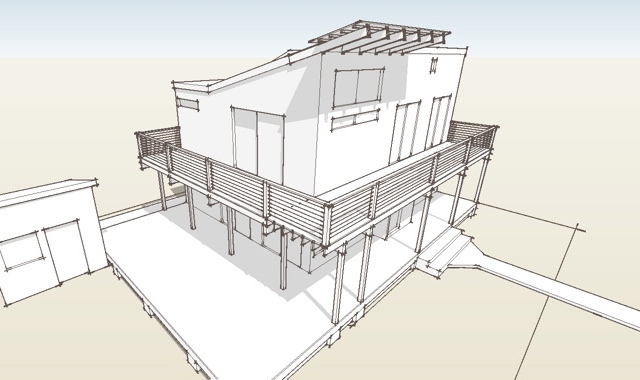 Continue reading "A small addition project"
I've taken a break from daily posting following the finish of the Maryland 6030 House. Much of my blog posting has been about things in the works, or speculative projects shown to measure interest. And many of these have progressed all the way to construction and the realization of the idea. The Arkansas Plat House, The Sage modular, the 6030, those being the most recent. Right now we are very busy with more projects both local and around the country. That's taken all our time, time that in the past we have been able to devote to developing new stock plans, or advancing other ideas and concepts. For now those things are going to have to move a little bit more slowly. Believe it or not I am still working on the U House a little bit at a time, so those new designs will eventually surface. But in the meantime the things we are working on right now will surface sooner rather than later. Because they are not speculative in nature I am holding off on posting about them until things are more final rather than blogging about the design process. I can't wait to share them and its taking all my self restraint. 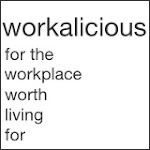 Continue reading "working like mad behind the scenes"